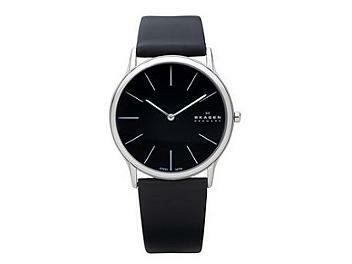 A round black dial with stainless steel case sits effortlessly on a black genuine leather band. The 39mm x 5.7mm super slim case and two-hand Japanese quartz movement make it a wardrobe must-have. This watch was delivered within a few days of ordering and was exactly as specified in the deion. My Fiance loves the watch - it's modern and slimline.